We are leading Exporter and Trader of Ledifos tablets(Ledipasvir 90mg + Sofosbuvir 400mg). 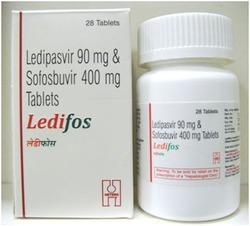 Ledifos is combination of Sofosbuvir and Ledipasvir is indicated for the treatment of patients with chronic hepatitis C virus (HCV) genotype 1, 4, 5, or 6 infection, Ledifos is a fixed-dose combination tablet containing ledipasvir and sofosbuvir for oral administration. Ledipasvir is an HCV NS5A inhibitor and sofosbuvir is a nucleotide analog inhibitor of HCV NS5B polymerase. Looking for Ledifos Tablets ?